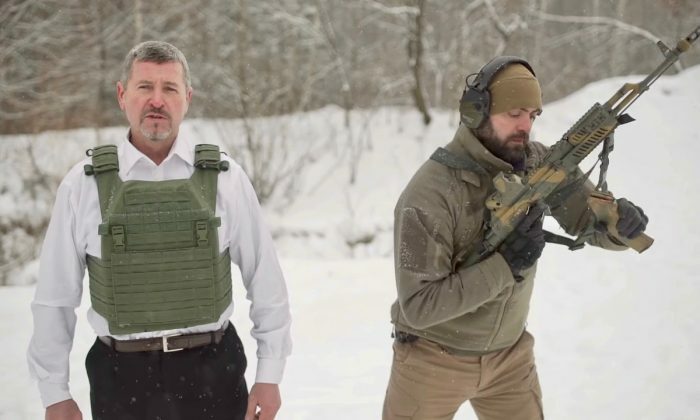 The head of a division at a Ukrainian body armor company showed an extreme level of confidence in his bulletproof armor by letting the public see him get shot with a rifle while wearing it. Vyacheslav Nalyvaiko let the shooter walk 33 feet away before turning around and shooting him with a Kalashnikov AKM rifle, according to the Daily Mail. Nalyvaiko then pulls out the bullet-blocking plate at the heart of the vest and laughs, as he shows the impression the bullet made on the front side. There is no exit point on the back side of the plate, although it appears to bulge from the impact of the shot. Nalyvaiko seems unphased, as if the entire impact of the bullet was absorbed by the material. The scene led some YouTube commenters to express disbelief. “He shot a blank, at a vest and plate that had already been shot. With a 7.62 round he would have been knocked around quite a bit.,” said Guns and Subies. “He didn’t even budge. No waiver, no step back. I don’t believe he was struck by a round,” said Charles Leistner, commenting on a Facebook post of the same video. The company’s Facebook page also features an earlier video in which an individual aims a handgun at his own abdomen and pulls the trigger while wearing the bulletproof armor. He also laughs afterward. Ukrainian Armor makes bulletproof body armor in both military and casual clothing designs. The company also sells bulletproof body armor for dogs, bulletproof book bags, and even bulletproof wallets, according to the company website. The company started when the Ukrainian military needed bulletproof armor, both during the Ukrainian revolution in 2014 and the subsequent Annexation of Crimea, according to the company’s about page.